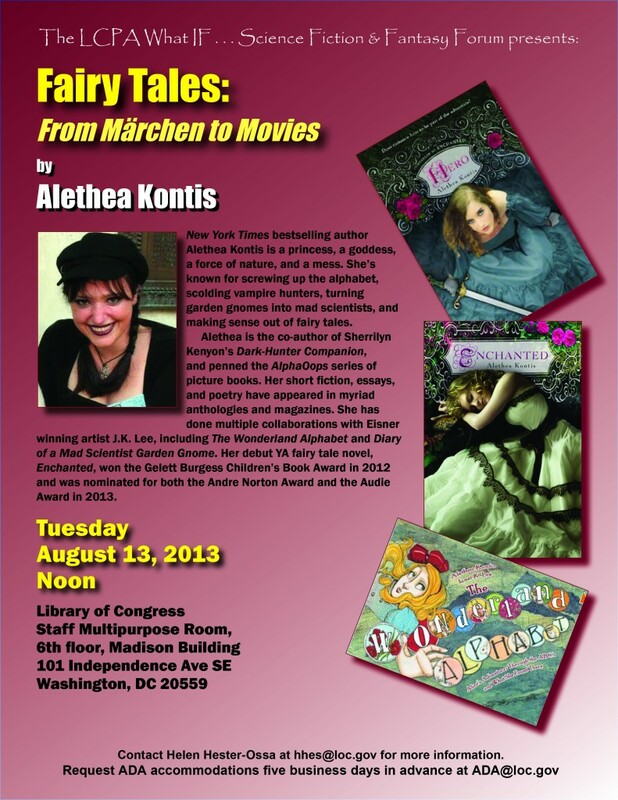 Here is the flyer for my talk at the Library of Congress next week! It’s 12:00pm on Tuesday, in the Madison Building (across the street from the main (touristy) LoC building. Go to the 6th floor and head for the Cafeteria. The Room of Requirement — I mean — the Staff Multipurpose Room is just off the cafeteria. The walls are all glass…so you can’t miss us. This entry was written by Princess Alethea and posted on August 10, 2013 at 3:56 pm and filed under appearances. Bookmark the permalink. Follow any comments here with the RSS feed for this post. You’re giving a talk at the Library of Congress! Whoah! I wish I could be there.